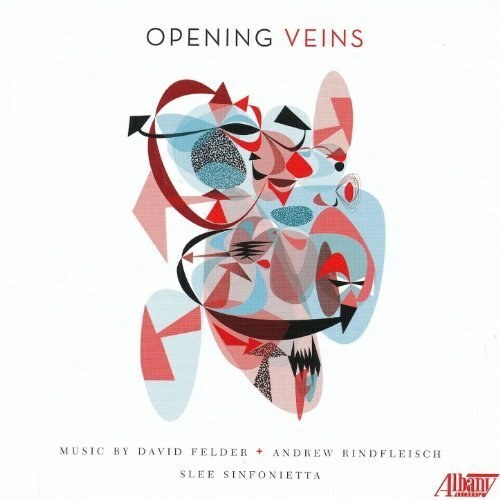 The pairing of David Felder and Andrew Rindfleisch on a record is not a particularly unlikely one. The liner notes declare that their work "couldn't be more different in concept or atmosphere" -- I mostly disagree. Both write in a harmonic style that is restless and unstable, but not prohibitively dissonant, allowing for memorable lines to take shape. A strength of both composers is their inventive use of sound colors available to them, supplied by the Slee Sinfonietta, co-founded by Felder in 1996. Felder's works both have a prominent piccolo and flute, which is a harder sound to capture flatteringly even with our current recording technology. Still, his pieces are both playful and serious. Each is in a rough two-part form, with a dramatic turning point occurring around halfway through. In Dionysiacs the mischievous flutter-tonguing flutes and the mysterious sounds of crystal glasses are symphonic brass chords. Inner Sky is marked by electronic effects, with speakers interspersed between the ensemble's players, dramatically altering the trajectory of the work up to that point. A certain aimlessness is corrected by the powerful effect, pushing the piece forward and allowing it to release enough energy to end slowly and quietly. Though each work on the record is 20 minutes or shorter, each feels substantial and satisfying.